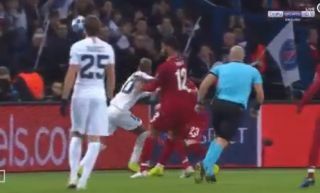 Neymar was in sensational form for Paris Saint-Germain against Liverpool tonight, producing this insane rainbow flick over two players’ heads. The Brazil international – love him or hate him – is a world class talent and entertainer, and while he’s sometimes criticised for lacking end product in big games, he did the business tonight. Neymar scored the winning goal in the first half, finishing off a superb flowing move that he started in his own half, and by this point in the evening he was just having fun.